Here is one of the Kelly Bracelets we mentioned earlier. The Pink Pearl, Kelly Bracelet is a much admired designer bracelet that continues to shine well into the 12 years we have been making it. We love our pink pearl jewellery at My Bridal Jewellery and these cluster pearl strands of 6x rows are individually knotted showing the petal soft tones of these lustrous small natural pink pearls. Delightfully unique with the weighty sterling silver hallmarked antique box clasp, with that old world vintage appeal. The drop pearl pink earrings set with natural aqua and pink baby pearls are set on bright sterling silver. These sweet drop pearl earrings can be worn oh so well just on their own. 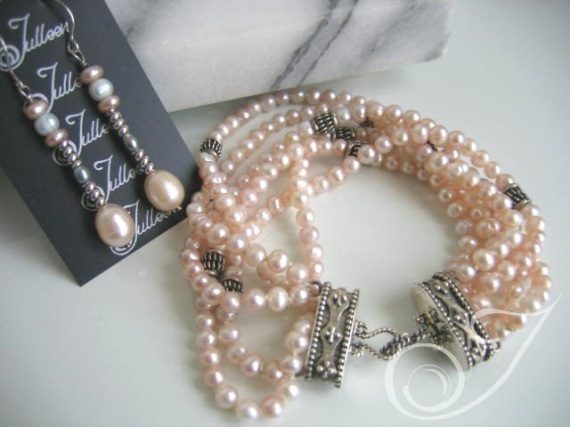 Kelly Pink Pearl Bracelet or contact us and quote product code E027.102 for the earrings.